Working conditions forced me to leave Alexandria and move to Cairo, which I experienced as dreary and noisy. Al-Azhar Mosque helped me endure the capital’s cruelty. It was one of the most comfortable places in Cairo and I used to sit in the mosque’s courtyard and look at the students attending lessons – most of them were non-Egyptians – and I felt as if I lived in another era. Years later, I was on a press mission to Assyut to cover the collision of a train and school bus. I noticed young boys dressed in traditional Azhar uniforms. It was the first time I had seen such a scene. In Cairo and Alexandria, Al-Azhar students cannot be distinguished from general education students, as everyone there wears the same clothes. I kept remembering that distinct scene until I had the opportunity to go to Assyut to check the situation closely. Fouad I Institute is the first Azharian institute in Upper Egypt. It is based in Assyut as it is located in the center. The inauguration was attended by Prince Farouk, who became king of Egypt two years later. When the students began to move to their classrooms after the morning flag greeting, I noticed that the number of students was low – 300 in total. This is partially due to the high rate of students switching from Azharian to public education. The former President of Al-Azhar Institutes Sector Sheikh Ja’far Abdullah said that 86,000 students abandoned Azhari education in 2014. The Azhar curriculum is a heavy burden on students, who study a total of 17 subjects. In addition to the regular public education curricula, Azharian students study religious and linguistic subjects. 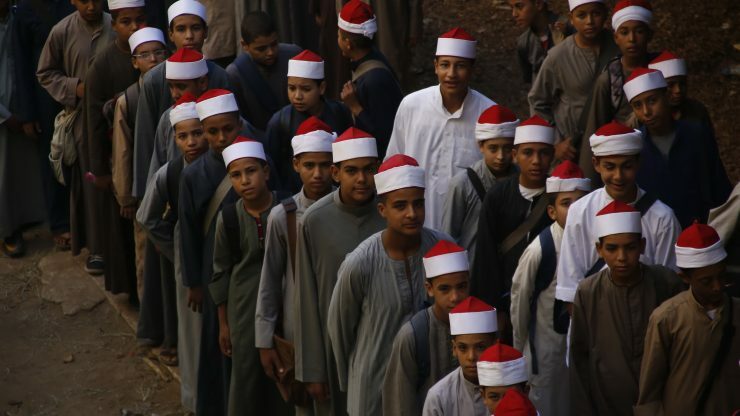 The teaching of the Holy Quran is initially the primary motivation for parents to enroll their children in al-Azhar, but it then becomes a pressure on students. They are obliged to memorize the entire Quran by the end of their secondary education. In university, students are examined every year in the Holy Quran, orally and in writing, according to specialization. They are required to memorize five parts in practical colleges and seven and a half parts in Sharia colleges every year. Students of the Islamic Sharia colleges are tested on the whole Koran in the last academic year. This explains the low grades in Azhar’s secondary school. The success rate stood at 51% in 2012, 55.2% in 2013, 41.63% in 2014 and 28.1% in 2015, the largest decline in Azhar’s secondary school history. The figure increased to 41.94% last year to reach 57.2% in 2017, which exceeds the normal average. Before I finished my visit to the institute, I wandered inside the library, which contained hundreds of books arranged carefully and respectfully to be utilized by the students. I heard a sound outside the library and followed it to find a teacher scolding a student. I listened to know why he asked the student to take off his turban so as not to be humiliated. With his head bowed and hands behind his back, the student listened to his teacher who was scolding him because he asked an old man for a drink. The scene was stunning. I returned to Cairo feeling that I was visiting a historic stage that no longer exists.